Kids Inspiring Kids has been providing assistance to about 3000 refugees since 2006. The vision has always been to eventually provide them with a new home. Now, with the impending demolition of their ghetto quarters, this dream has become a reality. With the assistance of local architects and planners, a new self-sustaining village is underway. 600 acres of land will be home to 200-300 individual family dwellings, two apartment-like buildings, a non-denominational church, a medical clinic, a community center, a marketplace, and a school system. There is plentiful room for farms to raise row crops and other fruits and vegetables. Livestock and local fishing will provide additional sources of food. With masonry and other durable construction materials, this village will not only impact these original 3000 refugees but will have a generational impact on thousands more. The Kids Inspiring Kids organization will maintain ownership and control over the property and the village. It will have controlled access through fencing and will operate under township rules. 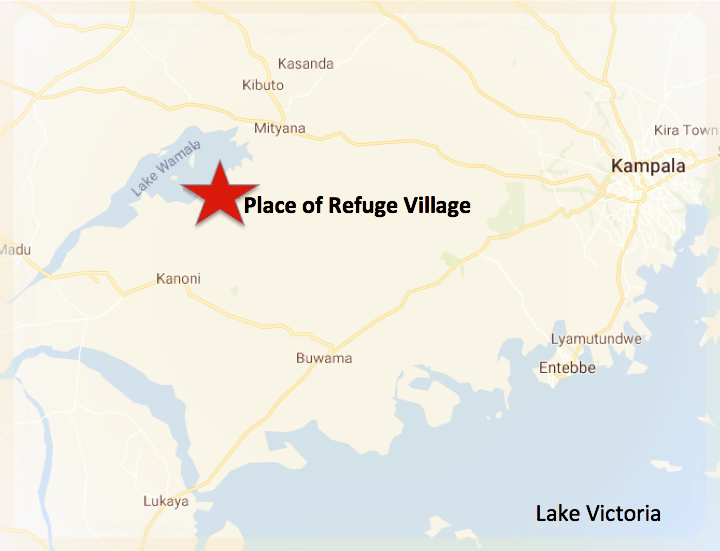 The village land is located in a very safe and fertile region of Uganda, about 45 miles west of Kampala. It will operate without any debt or obligations to the Ugandan government, with groundwater through hand-drilled wells and on-site solar panels for power. The Ugandan government is a democratic republic, and the country is peaceful without any active civil wars or excessive internal civil unrest. The rebel army of Joseph Kony has been inactive for the past decade. Therefore, this village will provide these people with the safe and durable home they so greatly deserve. This project is estimated to cost $3 million (US dollars), which would include the purchase of the nearly 600 acres of land, the materials, and the construction. With the immediate impact on 3000 people, this equates to $1000 per person affected. We seek donation support of any size, one time or ongoing, from individuals, corporations, or foundations. There is also an active and ongoing need for volunteer support on site in Uganda to help with the village construction. Kids Inspiring Kids was able to identify about 600 acres of ideal land for the village about 45 miles west of the capital city, Kampala. The private landowner was willing to sell this land in smaller parcels as our fundraising allows. In early 2017, the first nearly 100 acres of land was purchased marking the beginning of our village project. This land is situated adjacent to Lake Wamala, a 62,000 acre freshwater natural lake with abundant fish and other wildlife. Within this 600 acres is lakefront access which will ultimately allow for fishing and recreation for our village people. This fertile land has clean and potable groundwater that has already been accessed by our first few wells that were hand-drilled. There is existing coffee and fruit trees on the property, and the land has already successfully produced row crops that we planted upon possession of the property. This land provides a very safe region of the country to establish our village. The potential for corruption is at a minimum, there is no active civil unrest present, and there is no local geographical pressures in this expansive farming region of the country. In addition, the Mityana township is nearby to provide access to nearly every service needed. 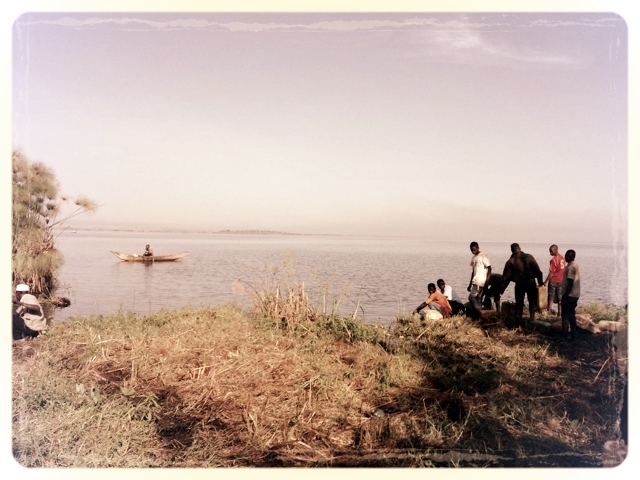 Our village land is located about 45 miles west of Kampala on Lake Wamala with access to the nearby Mityana township. Fantastic fishing opportunities will allow for food and potentially income for the village. In addition, this location allows for excellent groundwater access. Local architects have designed sustainable four-room dwellings as well as some apartment-style buildings for the families. 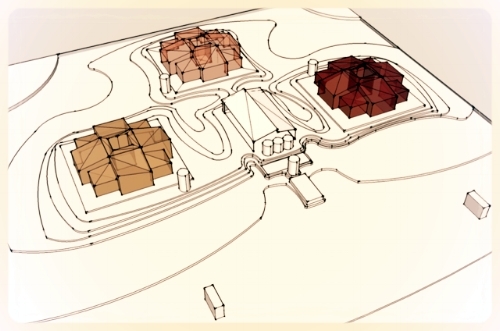 The dwellings will be arranged in clusters of three with shared cooking, laundry, and bath facilities. There will be hand-drilled wells and a sand filtration system set up for a source of potable water. The community will have a non-denominational church, a community center, schools (primary, secondary, and vocational), a health center, and a marketplace. There will be dedicated areas for crops and extensive fruit trees planted throughout the village. We will also populate the land with livestock of chickens, goats, pigs, and cattle. Kids Inspiring Kids will oversee the village construction and ultimately control the access and rules within the village. This village design and oversight will provide these families with a self-sustainable village that will endure for generations to come. Each family dwelling will consist of 4 rooms and will be constructed of masonry for durability. Each home will have 3 bedrooms for privacy, a family room, and a central courtyard. Family homes will be arranged in groups of three, which will share a kitchen, laundry, shower, and toilet facility. Running water will be provided to each pod and solar energy will provide power. The entire project is estimated to cost somewhere between $4 to $5 million (US Dollars), which includes the purchase of the land, materials, and construction costs. While we acknowledge that this is a substantial amount of funding needed, we also humbly recognize that it is quite amazing that a project of this magnitude can be accomplished at such a relatively small cost. In essence, we are starting from nothing and building a new town for a population of 3000, complete with individual homes, a marketplace, medical clinic, community center, school system, church, livestock, and farm ground. Just consider a town near you of 3000 population and imagine the cost to build that town from scratch. It is amazing what even small donations do to help this project. We are dedicated to using your donations efficiently, respectfully, and for programs for the construction of this village. Please consider joining our cause. Once funding allows, we have reputable contractors ready to supervise and construct the projects, ensuring a quality final product that will endure generations. When the first stage of construction is complete, we will proceed with the purchase of the final 400 acres of adjacent land and the construction of several apartment-style buildings, the remaining 250 to 300 homes, additional school buildings, a medical clinic, and a marketplace. Completion of the Place of Refuge Village is expected to take two years. We expect the overall price of the completed project to be between $4 to $5 million USD. Village construction has already begun, and we proceed with projects as the funding allows. Our goal is to complete the fundraising in 2019 followed by completion of the village by the end of 2020. We need your help to make this a reality!